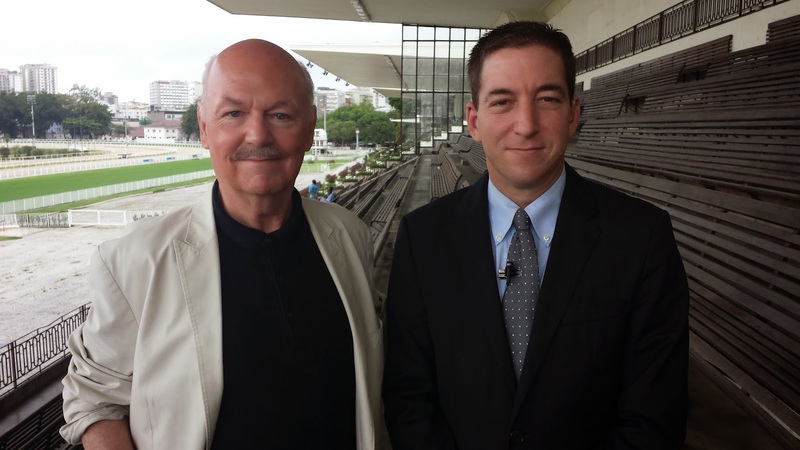 For those of you wondering, CBC News is currently in a freelance relationship with Glenn Greenwald. As both a journalist and a commentator, Greenwald has written for many prestigious media outlets in recent years, ranging from The Guardian to the New York Times to Salon.com. He will write and report for CBC News and will help provide context and analysis on the documents from the NSA. Greenwald knows these files well. He has spent months exploring the global role of the NSA working with material taken by a former National Security Agency employee, Edward Snowden. As with all CBC News content, stories generated by CBC reporters and Mr. Greenwald that are connected to these documents will be held to CBC journalistic standards. So the breaking discovery from this intrepid, fearless Wall Street Journal investigative reporter is that the freelance journalists who reported on a big story for a large media outlet with a byline were paid for their work. Is that ever not the case? Does MacDonald write his articles for free for the Wall Street Journal, or is he paid for his work? How much is he paid? Why has he not disclosed this? What is he hiding? Let the journalists who write articles for big media outlets without being paid for their work step up and be the first to support this attack. MacDonald's claim that CBC paid for "access to Snowden's documents" is equally false. The CBC does not have "access to Snowden's documents". They only have access to the specific, carefully selected documents that we are reporting on together. What they're paying for - under a standard joint freelance contract with both me and my freelance colleague Ryan Gallagher - is the work that freelance reporters always do: selecting and analyzing the material to be reported and then participating in the drafting and finalizing of the article and reporting (for both TV and print): extensive work we all did together. Aside from being completely standard, having a genuine freelance contract with media outlets is the only way to report on these documents. If we did not have such a contract, then the US government and its apologists (the very same people now criticizing us for having these contracts), would claim (dubiously but aggressively) that we were acting as a "source" or a distributor of documents, rather than as journalists in reporting them, and thus should lose the legal protections accorded to the process of journalism. As a result, we ensure that we negotiate a standard freelance contract so that nobody other than charlatans (such as those employed by the Wall Street Journal) could contest their authenticity and normalcy (for the extensive work we did in reporting and writing this story - one that broke news all over Canada and then the world - Ryan Gallagher and I were paid a joint freelance fee of $1,500). This is, yet again, nothing more than the standard tactic of distraction we see over and over. Just as was true of the Manning war crimes disclosures: there is a small cottage industry of pundits, bloggers, and journalists who evince zero interest in the substance of the revelations about NSA and GCHQ spying which we're reporting on around the world. The people I'm referencing literally almost never mention any of the actual revelations, but are instead obsessed with spending their time personally attacking the journalists, whistleblowers, and other messengers who enable the world to know about what is being done. Everyone having any sort of public impact merits critical scrutiny, and that certainly includes me. But when that scrutiny comes in the form of blatantly absurd and false attacks like the one from the Wall Street Journal - and from people who devote no time or attention to the substance of the revelations - then it seems clear that the attacks are little more than means of doing the NSA's dirty work for it: trying to discredit the journalists reporting on the story to ensure attention is shifted away from the spying revelations. As I said from the start, I'll answer these kinds of attacks now and then but it won't succeed in distracting attention from what matters. In the last six weeks alone, we've reported on NSA and GCHQ documents in Germany, France, Spain, Norway, Holland, the U.S., the UK, and now Canada. More stories are coming in these and other countries in the next two weeks. Nothing is going to stop or even impede our reporting the newsworthy stories around the world that show what is being done to internet freedom and individual privacy by the world's most powerful factions operating in the dark and with no real accountability. Those, evidently, are the ethics of The Wall Street Journal: if you publish radically inaccurate but incendiary accusations that are then proven totally false, don't retract them or apologize for them: just pretend you're "clarifying". The idea that journalists should be forced to disclose their compensation arrangements is moronic, but if you're going to impose that demand on others, you don't get to exempt yourself. So add that to the journalistic ethics of the Wall Street Journal: disclosure of compensation is for other journalists, but not for themselves.